Image caption Homeless people sheltering lighting fires to keep warm are thought to be the source of the problem. Residents have accused a council of not doing enough to tackle repeated deliberate fires at a tower block. The latest blaze at Haviland House in St Jude's, Bristol, on Sunday is thought to be the seventh in the past two months. Abdihakin Asir from Bristol Somali Community Association said security measures promised by the council weren't working. 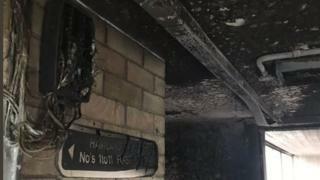 Bristol City Council said the safety of tenants was its top priority. Avon and Somerset Police said a crime scene investigator and fire crews were trying to establish the cause of the latest blaze. It started in a stairwell at about 01:00 BST and spread to a lift. Homeless people sheltering in a doorway at the block and lighting fires to keep warm are thought to be the source of the problem. Mr Asir said the fires were an ongoing problem at the flats and residents "don't feel safe". "Last time we met a housing officer in that building, he said that they increased the security patrols - it's not working," he said. "Residents are so worried that they think a similar incident to Grenfell may take place in that building unless the council do something. "One resident said to us that the smoke came into their apartment. That itself is huge risk for that family and their children." A council spokesperson said: "We are extremely concerned about this latest incident at Haviland House over the weekend and the serious impact it has had for the tenants feeling safe in their homes. "We continue to work closely with Avon & Somerset Police, who are investigating, to thoroughly review our security checks. "The safety of residents is always our top priority and there have been increased security patrols, as well as operational CCTV and on-site staff daily as a result of similar incidents there in recent months." Avon and Somerset Police said house-to-house inquiries had been carried out. "The Easton neighbourhood team will also be carrying out further reassurance work with the local community," it added.